Maya Bay Tours. Maya Bay is a picture perfect paradise with lush green emerald rock faces towering out of the water. It embraces the magical landscape and that is why it was chosen as the perfect location for the movie ‘The Beach”. It is an amazing location in Phi Phi Island where you get to explore the underwater life and feel the enchantment of snorkeling at multiple locations. Maya bay tour is a must do as it offer one of the most comprehensive tours to Phi Phi Islands. 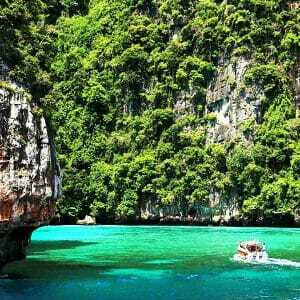 This tour gives you the opportunity to visit the less commercial Northern Part of Phi Phi Island including the magnificent Bamboo Island with it pristine white sandy beaches and crystal clear waters ideal for snorkeling. Maya Bay tours is enjoyed in this exceptional setting with it sheer green cliffs above the Andaman Sea, it small white sand beach with a dense encroaching jungle, and it reefs adorned with hundreds of multi-colored fish. This is indisputably one of the finest landscapes in Thailand. Discover the best day tours in Maya Bay Phi Phi Islands. It is also the venue of one of the best beach parties on the island. Maya Bay is accessible by boat, mainly from Phi Phi Island and Phuket. In either case, you will have no trouble. Maya Bay tour is one of the most popular tours in the country. The Beach is the perfect destination for any trip duration, half-day or a whole day. There is plenty to see and do at the beach. Maya Bay is great for spending time admiring the scenic views from the beach or getting more involved in various water activities that you can do. Most day tour includes stops at other snorkeling spots, especially Bamboo Island and Monkey Beach where you get to enjoy water sports and other breathtaking activities. The view from Maya Bay is one-of-a-kind. From the beach, you will have a fantastic view of the nearby limestone cliffs that make up the remainder of the Phi Phi Islands. The water is also bright blue which makes the entire experience perfect. There are several other pleasurable activities to enjoy while on Maya bay tour. This includes eating and exploring the lagoon.